I’m not ready to call the 2019 Ram 1500 the best half-ton pickup truck, but I think it’s my new favorite. Even after the novelty of the 12-inch touchscreen wears off, the cab is so comfortable and well organized that I felt like I could live in it. Or, at least, truck off on a 1,000-mile adventure in it. The Ram’s enormous, Tesla-esque portrait 12-inch digital display has been getting a lot of attention with its ultra-crisp revision of Fiat Chrysler’s snappy Uconnect infotainment software, even though the whole thing is only available with the fancier trims. While it certainly is cool, I think that the design of the seats, abundance of storage and layout of the consoles are what would make me enjoy traveling with this truck every day. On the pavement, the standard V8 Hemi’s performance and pulling power adequate but not exceptional. Similarly, the Rebel off-road variant was fun to toss through soft sand but I didn’t get the impression that it was up for hours and hours of aggressive use. Overall, I’m pretty smitten with the 2019 Ram though. That should already tell you a lot about how good the interior design and chassis really are. The 2019 model year kicks off the fifth generation of the Ram pickup, and the second iteration of the truck since the company split off from Dodge, if you care. Plenty of people do care about this model one way or another–FCA reports that it sold 500,723 Ram trucks in 2017. FCA’s got some catching up to do, so the company should be motivated to make one hell of a truck here. And like I said, I think it’s on to something. Ram claims that a 2019 1500, properly spec’d up, will have a maximum payload capacity of a whopping 2,300 pounds or be able to tow 12,750. But of course, the truck needs to be optioned and configured a certain way to hit those headline capability claims. With the base V6 “eTorque” engine, four-wheel drive and a short bed, the new Ram can pull 6,370 pounds on a standard hitch and haul 1,770 pounds in the bed according to Ram’s consumer website. That’s still a fair bit of heft, and the towing limitation increases dramatically when you order the V8. We spent a lot of time talking to engineers about what eTorque means, what it does and why it’s being used in this truck at the 2018 Detroit Auto Show. If you haven’t already, you should really check out David Tracy’s story to get the full rundown. But basically, this system piggybacks an electric generator onto the combustion engine, theoretically giving the truck a boost of torque at low speed and an overall increase in efficiency. While Ram’s new mild hybrid system represents one of the most dramatic changes to the truck for 2019, it’s not going on sale for some time, so we were only able to shake down the traditional 5.7 liter Hemi V8. 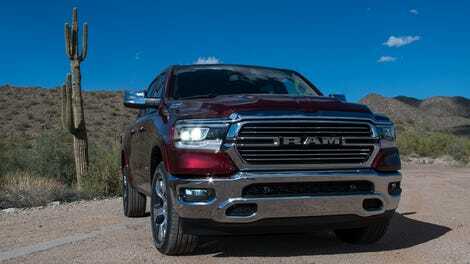 By the end of the year, Ram’s reps assured me that you should be able to order this truck with one of three engines: a 3.5 liter V6 eTorque making a claimed 305 horsepower and 296 lb-ft of torque, the regular-old V8 we tested, rated at 395 HP and 410 lb-ft of torque, and that same V8 hooked up to the eTorque mild hybrid system. Every engine runs a smooth eight-speed automatic and 2WD is standard, 4WD is optional. The future of the EcoDiesel is TBD, though Ram’s people insisted it is indeed coming back after all the gas engines have launched. The truck will be built in the same configurations it’s had in the past: full four-door Crew Cabs with a short five-foot seven-inch bed or a long six-foot four-inch bed, shorter Quad Cabs with the long bed, and eventually single cab work trucks which will presumably get an eight-foot bed option. The new Crew Cab has an extra four inches in length over the current one, which makes the reclining back seats quite a bit comfier. The cheapest 2019 Quad Cab 2WD Tradesman will at $31,695 with the fanciest Limited luxury trim trucks with every option topping out at over $70,000. When I configured the 2019 Ram I’d want myself, a comprehensively equipped but modestly appointed V6 long bed 4x4, it rang up at around $48,000. 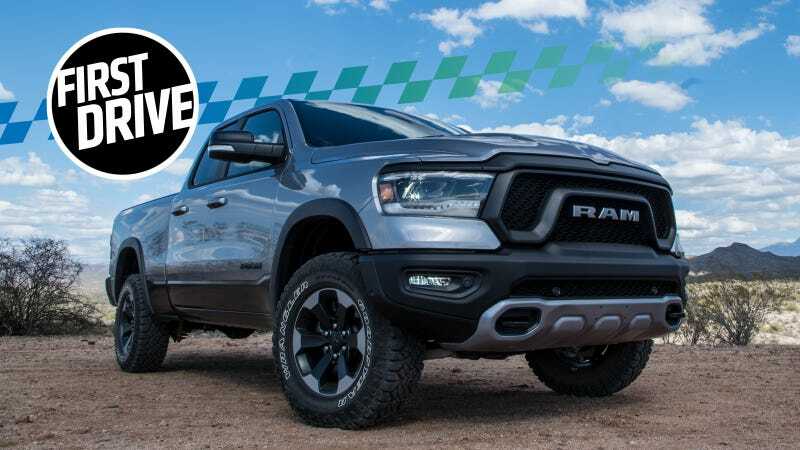 If there are any more specs you’re trying to find, Ram has set up a huge data directory for the 2019 1500 that you can sink your teeth into. The production truck will not get this funky blue anodized frame, but there is some pretty neat stuff owners will be able to appreciate in this picture. Starting with the front: that bowed black strip that looks like a windshield wiper blade is the air dam. You see these on pickup trucks all the time, and most people complain about how much they hurt ground clearance while engineers insist that they bump fuel economy. The Ram’s is electrically powered, allowing it to tuck up for scrambling over stuff and drop down two and a half inches on the highway to make the truck more streamlined. Above that, you’ll notice that the frame is bowed out instead of protruding straight ahead. Ram’s engineers claim that this, combined with extra frame reinforcement behind the front wheels, will make the truck significantly safer in an offset headlight-to-headlight kind of collision. Finally, we have two soup can-sized cylinders hooked up to wires and bolted to the frame that Ram has dubbed the Active Tuned Mass Modules. They’re effectively digital balance shafts, which means that they vibrate to offset engine vibrations. I can’t say I physically watched them work, but I can promise that even the lowly Tradesman trim felt remarkably smooth and comfortable no matter what RPM the engine was at or how many cylinders were in use. Uconnect has been easy to use and easy on the eyes for as long as I can remember. The fourth version of the software takes it to a whole new level with remarkably sharp resolution. It looks good on the 8.4-inch screen. On this 12-inch display, the infotainment system is as big, bright and idiot-proof as the menu at Denny’s. Ram has made good use of all that digital real estate, too. You can run one app in an overwhelmingly large scale or split it and run two at once. You can also run Apple CarPlay on the top half of the screen, and keep the bottom half for the truck’s own controls which is pretty trick. Impressive as it is, I think I’d rather have the more traditional 8.4-incher if this were my truck. There’s only so much button-prodding you can really do while you’re driving, and it turns out you do not need an entire tombstone-sized screen to do it on. Perhaps best of all, regardless of which screen you pick–if you get tired of it entirely, there’s a “SCREEN OFF” hard button just below the tuning knob and a “MUTE” on the left. And man, we haven’t even started talking about the toggle switches below the screen! They have the same utilitarian design and feel of the ones GM introduced a few years ago, but they’re a little tidier. I dare say they look more mature here. Anyway, we’re talking about what I do like in this truck. The seats are fantastic, especially the Deluxe Cloth option, which feels like a fancy light jacket. The full-length console is great too, packing many slots and buckets and sliding holsters you may never see your phone again after you drop it in there. Except you will! Because that little plastic lip just below the toggle switches is a phone shelf with irrigation lines for your charging cord, just like your desk at work. Great sliding action on this, too. Obviously I’m also a huge fan of the 33.3 by 43.4-inch panoramic sunroof option too, which is absolutely worth $1,500. And this might sound silly, but the interior door handles on this truck are works of art. Shapely, elegant... if only they were made of a nice heavy metal they’d make this truck feel seriously special. Hell, why not order one from the Mopar parts desk and see if a fabricator can cut you a custom set from steel or aluminum? I also like that this truck comes with a mild off-road package that turns the truck into a solid starting point for your adventure vehicle build. It gets you skid plates, a rear locking differential and a one-inch lift. Get some high-quality wheels and meaty tires on there and you’re set to head for the hinterlands. No Ram that we saw had leaf springs at all. You can pick between heavy spring coils and a multi-link suspension, which I’d get if you want to go off-road, or air bags which make for a supremely soft ride and adapt to how much weight’s in the bed. I wasn’t crazy about some of the interior material choices, particularly in the Rebel. The “tire-tread pattern” seats look more like “weird stains” and I don’t even know where to start with the miniaturized diamond plate plastic pieces. The V8 Hemi didn’t feel very ambitious when paired up with the more efficiency-focused axle ratio, and the truck felt like it was working pretty hard to pull a 20-odd foot ski boat in a brief towing test we put it through. But in both cases, the truck’s performance still seemed acceptable to me. As far as off-roading, you can spec this truck with knobby tires and a locker which will get you pretty damn deep into the backcountry. The Rebel’s Bilstein shocks will put up with a little roughhousing, but I think sustained speed over really harsh surfaces would overwhelm this truck while a Chevy Colorado ZR2 or, definitely a Ford Raptor, would have a higher tolerance for that kind of heat. After a couple laps of Ram’s off-road course, the demo trucks were already smelling like cooked fluid and seemed to be using up all nine inches of travel pretty readily. The truck’s off-road capable, it’s just not extreme. Supremely comfortable, utility for days. A locking diff and the right axle ratio unlock a pretty fun drive. After a day of tooling around Arizona in a few different trims of the 2019 Ram, I’m really excited about this truck and think it’d make a great worker—or adventure rig. I didn’t get the impression that its performance blew its competitors or the outgoing model out of the water, but the Ram felt sufficiently strong and as you’re probably tired of reading by now–I really think the interior of this truck has the best looking design of any half-ton. And it also happens to be endlessly useful. That’s what a truck’s supposed to be all about, after all. Next, I’m eager to see what the eTorque hybrid V6 can do. Between that and the giant screen, Ram’s built one of the most progressive trucks on the market. We’ll see if it’s enough to steal some sales from Chevy and Ford.